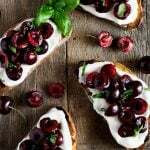 Whipped ricotta toast with deep red, fresh cherries tossed in balsamic vinegar and scattered with some chopped basil leaves. So pretty, so easy and so delicious! Cut the cherries in half and remove the stones and stalks. Add to a bowl with the balsamic vinegar and a pinch of salt and pepper. Toss to combine and set aside.